Refines last year’s genre-setting Origins with RPG infused gameplay and even more killer spectacle. There tends to be some complaints when a franchise starts to release on a regular and predictable basis. I don’t know how accurate those complaints tend to be; if a formula works, I tend to be pretty happy with games that follow a winning playbook while steadily adding more content. I tend to enjoy the yearly Call of Duty releases as a result, and always find myself looking forward to the next with anticipation and curiosity; the same sentiment definitely applies to Ubisoft’s long-running series of death and mayhem, Assassin’s Creed. We’re seeing the first in what will almost certainly be a long list of assassin adventures built off the precedent set by last year’s fantastic Assassin’s Creed Origins (still my pick for Best Game of 2017) with this year’s excellent follow-up: Assassin’s Creed Odyssey. 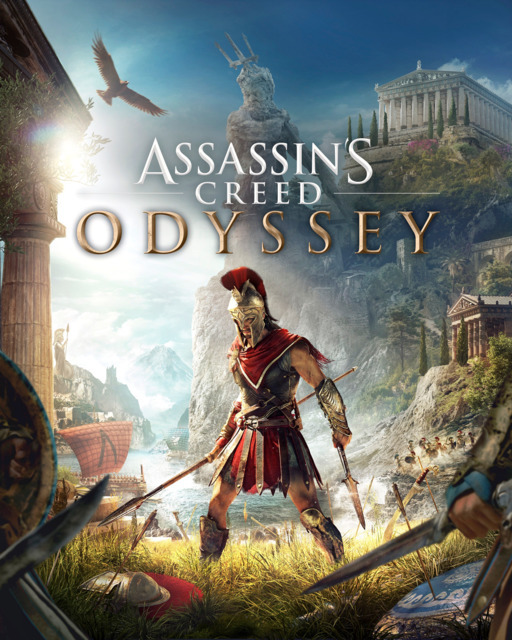 In true Assassin’s Creed fashion we’re returning to the stage of history, this time to the gorgeous vistas of ancient Greece. For the first time in the franchise we’ll choose a hero to follow – either Alexios or Kassandra, siblings much like Syndicate’s duo Jacob and Evey, though unlike that game we don’t switch between the two here. They journey through the myth-fueled lands of Greece, helping people, killing people and gathering loot all the way in true RPG fashion. Yeah, I think we can probably call this an RPG now. Origins was well on its way, but it was lacking one critical part of the experience that’s front and center here in Odyssey: a dialogue system. Alexios and Kassandra are your characters to define, including how they react to situations and the reputations they will eventually build and maintain. What you say and how you say it can unlock side quests or even lock you out of endings, so it’s important to be mindful; there’s also room for additional playthroughs since there’s a surprising degree of variation here based on how you behave. As you’d expect, gameplay overall is essentially a more polished take on Origins. Combat, both on land and sea, is largely identical but enjoys the benefit of a year of additional development. There’s a focus on parrying now rather than blocking, adding an essential timing element to defense that makes avoiding attacks feel much more rewarding. As in Origins, battle flows well and feels nice and snappy – your ability to defend yourself in open combat means that unlike many stealth-focused games, being caught doesn’t feel like the end of the world. Those RPG elements also play a big role in the action and adventure, namely because you’ve got customizable gear these days. Gear is more than just cosmetic, offering buffs to aspects of your character as well as varying levels of defense, so there’s definitely some fun to be had finding and putting together different sets to match the way you like to play. A straight-up berserker is going to end up wearing very different kit than a more traditional stealthy character, after all. Likewise, you’ve got skill trees for the player who wants to fight, shoot, sneak or a combination of the above, and planning out where you put your skill points allows you to make your hero feel unique. This even extends to your ship! It’s gorgeous, too. Origins was as well, without a doubt, and it’s nice to see the same level of eye-popping detail show up in a more varied landscape. If you’ve got a decent PC, you can really make this one sing; it was one of the first games I experimented with when I installed my new GeForce RTX 2080, for instance, and it’s absolutely stunning as a result. Those who adventure with consoles can also expect a quality bump, especially if you choose the Xbox One X and its 4K-powered bonuses. But hey, this is a stunning looking game no matter what version you play; it’s even slated for the Switch and Chrome browsers, albeit in weird streaming-only modes, but that’s something! Sound-wise there’s generally very little to complain about, with a characteristically bombastic score threading the emotional needles at the right moments and impressive audio clues helping guide our would-be killers through ancient Greece. Everything is acted out, too, though there’s a certain accent that’s common to pretty much every character here and the voice actors handling their roles tend to vary in both quality and said accents. Mid-level voice-acting in a game isn’t the end of the world, and given the setting you really shouldn’t be surprised. There’s over 60 hours of adventure here, so you’re certainly getting some value for your money. Assassin’s Creed Origins was one of the best games of last year – I’d argue perhaps the best straight up – and Assassin’s Creed Odyssey carries that torch and runs with it. It may not be the genre-setting spectacle Origins was, but it certainly continues to refine the exquisite template that not only helped save Ubisoft’s franchise from itself, but redefined what an open-world experience could be. Adventure, stealth and combat lovers alike are going to find something that’ll pique their interest here. It’s time to hop back into the Animus once more.